Until the mid 1960's Aviemore was a sleepy and unremarkable village about an hour's travel southeast of Inverness, on the A9 and the Inverness-Perth railway line. Then the developers moved in and transformed the place. The slopes of Cairngorm, a 4,000 ft mountain seven miles to the east, were developed for skiing and Aviemore itself was virtually doubled in size as a new holiday centre took shape behind the village. 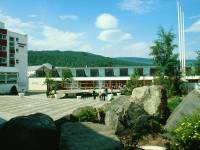 The Aviemore Centre consisted of hotels, shops, chalets, indoor sports facilities, a dry ski slope, a cinema, bars and restaurants, and a craft centre. The Aviemore Centre generated a lot of flak. Not only did it more or less eclipse the original village, it pitched itself downmarket and, some would say, appeared to regard itself as the Blackpool of the Scottish Highlands. Its critics were less kind and denounced the concrete blocky appearance of certain parts of the development. There were tales of scams, corruption and sharp employment practices. A new shopping parade in the village itself added to the gloom, being very much from the cinder-block school of architecture. 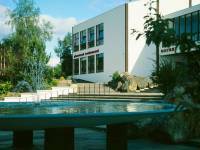 I was always in two minds about the Aviemore centre itself. Parts of it were imaginative and tastefully landscaped but there was a definite atmosphere of shabbiness about the place and its visitors. By the mid 1990's the place was looking distinctly tatty and badly in need of refurbishment. 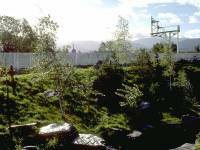 But I was astonished to arrive for a short holiday in late 1999 to find that much of the Aviemore centre had been razed to the ground. Two years later little had changed and the site was a vast car park. Elsewhere in the village, though, things were looking up. A second and much more tastefully constructed shopping mall had taken shape adjacent to the railway station, itself refurbished. A spanking new supermarket stood opposite, and other new developments and outbreaks of imaginative landscaping were transforming the village, which was at last shaking off its downmarket image. 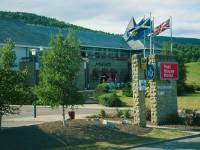 The true attraction of Aviemore, of course, is its setting rather than its facilities. With the Cairngorms, Glenmore and Rothiemurchus close by, Aviemore is a base for a superb range of valley, forest, hill and mountain walks as well as bird watching, sailing, skiing, cycling and other outdoor pursuits. 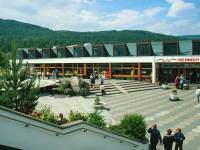 The Aviemore centre, seen on one of my earlier visits in 1978. Part of the Aviemore centre. The Pinewood Restaurant (depicted) was an agreeable little cafeteria in its day. The building still stands but the Pinewood itself is long gone. 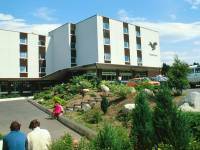 The Aviemore Post-House Hotel, standing to the rear of the Aviemore centre, escaped the recent outbreak of demolition. 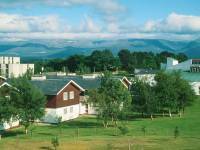 The chalets of the Aviemore Motel, with the Cairngorms forming the backdrop. 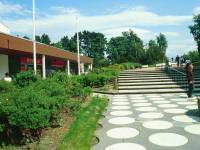 Landscaping within the Aviemore Centre, now gone. 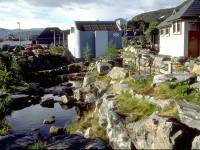 This part of the Aviemore centre did look good and I enjoyed spending time here. The building to the left housed Aviemore's cinema, and I remember seeing the second Star Wars movie here in 1980. Everything you see here has now been demolished. 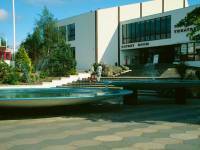 The indoor sports hall and the central piazza, all gone now. One of Aviemore's "concrete block" hotels - still standing but the shops on its ground floor level are empty and boarded up. Moving forward to 1999, and some imaginative landscaping just north of the railway station. This rocky grotto includes a pedestrian underpass crossing the railway line, and is rather beautifully lit at night. 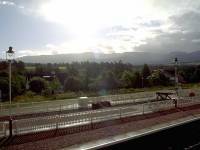 A contre-jour shot from the railway station in the direction of the Cairngorms.